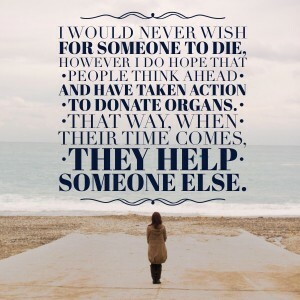 I don’t know that anyone wants to give a lot of thought to organ donation, but yesterday morning as I ate breakfast, my mind turned quickly to the topic. I got a simple text from a friend at work asking me how long someone would be in the hospital and what sort of diet he was on. After traveling for several days at the seemingly speed of light, my mind couldn’t even process what she was asking. I replied asking if she meant to send the note to me. When she asked “is this Janice?” and then said “I thought you’d know” I immediately opened Facebook and went to a friend’s profile. I had missed the fact that my dear friend Debbie Lyons-Blythe‘s son Tyler had been hospitalized. I had been following his health the last couple of weeks closely since Debbie & I went to BlogHer 14 together. The post was there saying they still weren’t sure what it was that had Tyler in the hospital and doctors were working on it. I sat there in shock. This was definitely bad. We had been talking for the past few weeks and Tyler had gone from a totally healthy farm kid (check out his senior photo shoot & rolling a cow! ), to a kid who wasn’t feeling good and then to a kid where something was clearly wrong that needed to be diagnosed. There was something happening with his liver but it was hard to figure out what was up. In the hours that came, I saw pictures of the Blythes playing card games — Tyler in the hospital bed and siblings around with cards in their hands. I also saw the one that said it was determined Tyler needed a liver transplant. And I saw this photo of Eric, me, Duane and Tyler walking off the field at the Rams game (I cut out Debbie cause she & April were making faces! LOL). And I thought about how Tyler, like my nephew, was set to start college in the next couple of weeks. You may recognize this photo of the Blythe family. 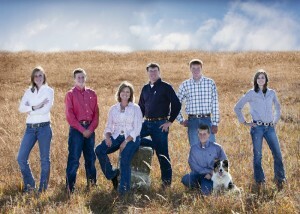 It’s Debbie, Duane, their five kids — Megan, Trent, Allie, Eric & Tyler — and Roo the cow dog. 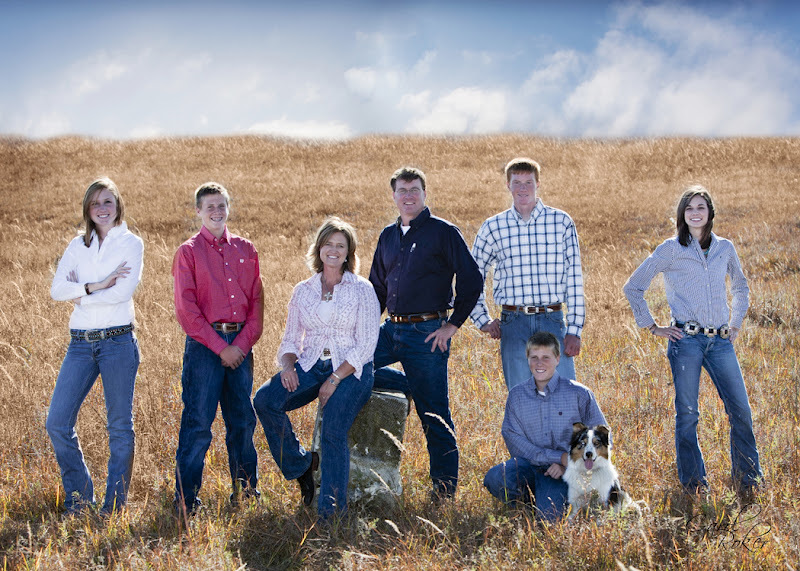 The photo was on my blog when the kids nominated Debbie for farm mom of the year and the Blythes all like the photo so they use it on her blog Kids, Cows & Grass as well as Facebook. This photo is in a lot of our minds right now. People are connected to various members of the Blythe family. Each of them has a heart of gold and personality that keeps smiles coming. The family feels the strength of prayers from all over — through phone calls, texts, Facebook messages and more. They are waiting …. Tyler is on the transplant list. Lots of people wish they could help Tyler. That’s not something easily done. What we really need is for someone who has a tragedy happen to have been forward thinking. 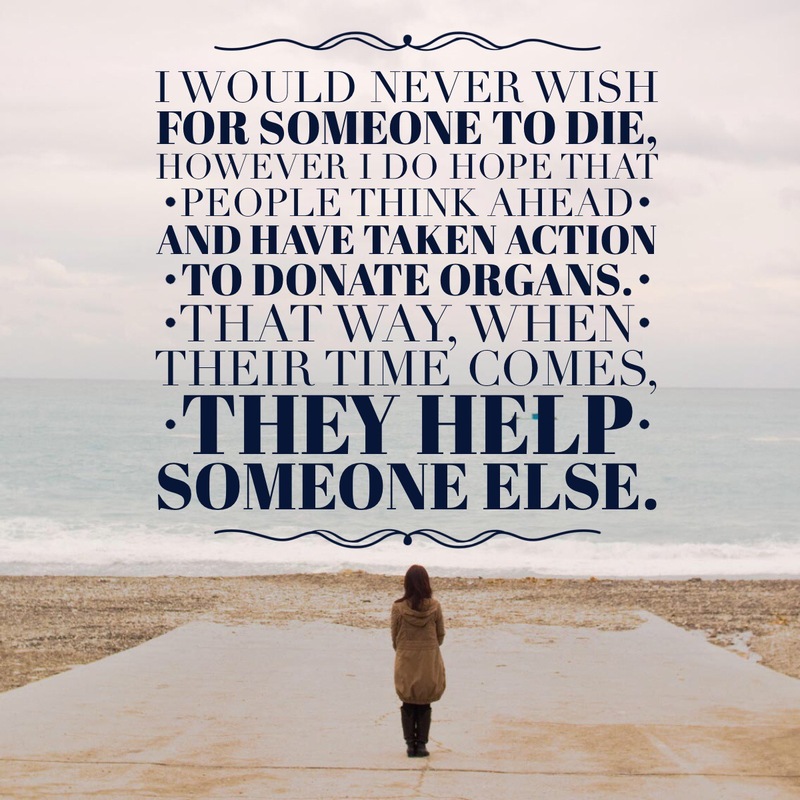 To have a liver donated means someone else needs to donate one (he needs a full liver, not a partial one) and that means that someone else has to have thought ahead and made the forward-looking decision to donate their organs when they die and to make sure their wishes are clearly understood. I can’t imagine the donation coming from anyone we know because that means the tragic loss of a friend. I can’t imagine sitting here wishing anyone would die but the hard reality is things happen. People going about their day-to-day and something changes in an instant — Tyler won’t benefit from that but what I can hope is that some of those people thought ahead about how if they have to die, how nice it would be to help someone else who has other possibilities. If that’s the case, Tyler will be the one to benefit from some stranger who thought ahead. I’ve previously made my participation in organ donation clear. It is on my driver’s license and I’ve talked about it with my mom and siblings now and then over the years. On the other hand, knowing someone like Tyler and the Blythes could be waiting whenever it is that I die…. The person needing the transplant could be the girl next door. I have to be clear that I want to help. There is a national organ donation registry run by the US government’s Health & Human Services. I went to the registry and entered my information and it said I had indeed previously registered. I went in to be sure I was comfortable with the types of donations I had selected. And I made sure my family had that solidly in their mind… that I wanted to donate. If you aren’t sure whether you filled out that piece of your driver’s license or whether you have let others know what you are thinking…. you can read through the information on organdonor.gov and then walk through the process to become an organ donor. Your donation won’t help the Blythes directly but I have to believe that they will find it a relief that families in the same spot in the future may get the silver lining in something bad happening to a stranger who thought ahead and took action. « Where do you stand on Selfies? Backer or Backlash? This is very important! Thank you for writing on Organ Donation, its on my DL & I’m in the national database for bone morrow donation as well. The life you save may very be a family member of your own . Great point about the bone marrow registry too! Thank you so much for talking about this subject. People don’t like talking about it because it involves thinking about their death. But they don’t realize how many lives can be saved by making the one decision. Lots of prayers for the Blythe family and I hope Tyler doesn’t have to wait too long to get his liver! Yeah, it is no fun to think about my death but I guess it is better to think about it & communicate what you want clearly. I would like to know what others would like too. Many prayers for the Blythes! My pleasure. You have to think that there is so much ahead of Tyler… I just hate that another family will suffer a loss so he can have his future. You’ve done a fantastic job of bringing this to light. My Dad was a liver recipient back in 2003 after being diagnosed with Alpha 1 antitrypsin deficiency. It’s a most difficult prayer to pray, for a transplant. You know that somewhere out there is a family who is experiencing the heartache you yourself once faced. I went on to become a nurse, marry and have a family of my own that now runs our family farm along with my parents. God is good and everyday I pray he watches over our donor family and I thank he and our donor for their amazing gift. We have not once taken the years and memories since for granted. Again, thank you for sharing this story and I will be praying for the Blythe family. Cenchrea, I appreciate your sharing your family’s journey through the transplant process and the way it has impacted you. I have had friends who needed transplants but none as close as the Blythe family. Am thankful that I already know that I’ve made plans to help others when something befalls me. I, too have been a donor for many years, but it now takes on a whole new meaning and sense of satisfaction knowing that someday, I might help someone like Tyler. I am Debbie’s Uncle Bill, Jan’s youngest brother. We are all in shock and are praying that Tyler gets a transplant soon. Thank you for shining the light on the donor aspect of this. If you have convinced one person to donate, you may well have just saved a life like Tyler’s! Nice to meet you Uncle Bill. Tyler stays in my thoughts as does the rest of the family…. and for me, the family of some stranger who will provide a liver for Tyler. I like the thought of just one person having had such a great impact, but you know, one person’s donating can help so many people! It is my pleasure to help. PS — I just love Debbie. We have had the chance to travel together to NY, CA and simply the middle of nowhere Kansas. I should say, I have designated myself as a willing donor, technically, not yet a donor! Thank you for sharing this information Janice – I’m checking out the Organ Donor site now. Prayers to sweet Debbie and her amazing family. She is totally and inspiration to us all and I treasure being able to meet her at BlogHer14 being a part of the Farm Team. Thanks! I am sure the Blythes appreciate it! Beautifully said, Janice! I am overwhelmed with the support of my friends and family. We are praying for healing and patience, while also praying for peace for whoever has planned to donate their organs and end up sending the gift of a liver to my son Tyler. He is hanging in there, dealing with some pretty rough symptoms of very high bilirubin levels. While we pray for that gift to come soon, we also pray for the family of his donor. Your family is in my thoughts daily! Did you know you can have a live donor for the liver? My colleague who is alive and well was a live liver donor for her sister. This topic of organ donation is very near and dear to me because my dear friend, who I’ve known since high school, just went through a two year ordeal waiting for a heart transplant. He became so sick while he waited that his other organs started shutting down, and in January of this year he had a heart and kidney transplant! He is 43 years old, the picture of health and fitness. And he’s a miracle. He and his family just came out to Colorado for vacation a couple weeks ago, and we were blessed to spend time with them. He would not be here today without the selfless generosity of the organ donor. You can make a real difference even after you’re gone. It is true that many if not even most liver transplants can come from live donors Margaret but Tyler’s surgeons determined that because a disease has caused the issues at his bile ducts, that he has to have an entire liver. We are still waiting for Tyler’s miracle and we hope it comes soon as his health continues to fall. Thanks for trying to help! Wow, I hope this young man gets the help he needs. My dad just passed away this past week because of liver failure. Apparently he knew about this 7 years ago, thought he’d be fine, and then, the proverbial poop hit the fan. Within 2 months, my father was gone. Your post has reminded me that I wanted to look into this. I have many tattoos and was told that this could affect my donating organs, but I’ll look into it anyway. If I could save a kid’s life when I’m gone, then why would I not want to do it? Remember that film with Will Smith, where he gave life to so many people by donating his organs. That was a deep film. Best of luck to your friend and God bless. Angel, I am so sorry to hear about your dad… thanks for the kind words. I need to write a followup post as he got a liver while I’ve been on vacation. He is recovering well and we are hopeful he will get back to normal in the next couple of months. I have always been an advocate in organ transplants but the person or family should be compensated. “As in their body is part of their estate” Many of these families also could use the money towards other health related problems that will arise. Interesting. I think the guideline of not compensating was put into place as some unethical people were doing things that worried people. Not sure putting a law into effect really makes the system work better…. I would hate to think financial gains were the reason people would donate on the other hand I hear you on the other expenses, etc. It is all pretty complicated for me.